Azari, Abbas, Mirmoini, Mehdi, Mohammadi Oujan, Shadi. (1397). Understanding Temporal Human Mobility Patterns in a City by Mobile Cellular Data Mining, Case Study: Tehran City. معماری و شهرسازی آرمان شهر, 11(22), 81-94. Abbas Azari; Mehdi Mirmoini; Shadi Mohammadi Oujan. "Understanding Temporal Human Mobility Patterns in a City by Mobile Cellular Data Mining, Case Study: Tehran City". معماری و شهرسازی آرمان شهر, 11, 22, 1397, 81-94. Azari, Abbas, Mirmoini, Mehdi, Mohammadi Oujan, Shadi. (1397). 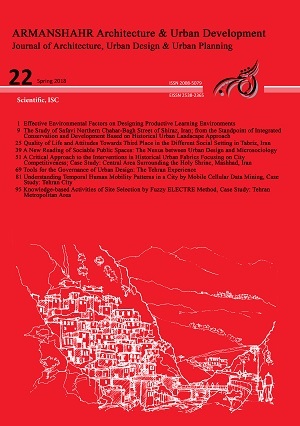 'Understanding Temporal Human Mobility Patterns in a City by Mobile Cellular Data Mining, Case Study: Tehran City', معماری و شهرسازی آرمان شهر, 11(22), pp. 81-94. Azari, Abbas, Mirmoini, Mehdi, Mohammadi Oujan, Shadi. Understanding Temporal Human Mobility Patterns in a City by Mobile Cellular Data Mining, Case Study: Tehran City. معماری و شهرسازی آرمان شهر, 1397; 11(22): 81-94. 1Ph.D. Candidate in Urbanism, Nazar Research Center, Tehran, Iran. 2M.A. of Urban Planning, School of Architecture and Environmental Design, Iran University of Science andTechnology, Tehran, Iran.,. 3M.A. of Urban Planning, School of Architecture and Environmental Design, Iran University of Science and Technology, Tehran, Iran. Recent studies have shown that urban complex behaviors like human mobility should be examined by newer and smarter methods. The ubiquitous use of mobile phones and other smart communication devices helps us use a bigger amount of data that can be browsed by the hours of the day, the days of the week, geographic area, meteorological conditions, and so on. In this article, mobile cellular data mining is introduced as an emerging approach in analyzing and understanding human mobility patterns, then generic location update is examined as a way to observe and perceive human mobility and movement in cities. This method was examined in Tehran metropolitan area map, the results show that different urban issues can be understood and solved using this huge amount of data like urban transportation, social problems or urban functions. Tehran cellular data analysis shows that it can be recognized as a city in two major parts, the border zone which is mostly the origin of all trips and the central zone which is mostly the destination of all trips and the most visited hotspot of the city during a normal day, also it was concluded that because of low population density in this part of the city and very high human mobility throughout a day, this area would have many social security issues. In the end, taking advantage of more accurate data in cell level was proposed in order to have better and more reliable assumptions about future mobility trends and co-presence patterns. Albeverio, S., Andrey, D., Giordano, P., & Vancheri, A. (2008). The Dynamics of Complex Urban Systems, Springer. Barabasi, A.L., Song, C., Qu, Z., & Blumm, N. (2010). Limits of Predictability in Human Mobility. Science, 327(5968), 1018-21. Batty, M. (2013). The New Science of Cities., The MIT Press, Massachusetts Institute of Technology. Batty, M., Axhausen, K.W., Giannotti, F., Pozdnoukhov, A., Bazzani, A., Wachowicz, M., Ouzounis, G., & Portugali, Y. (2012). Smart Cities of the future. The European Physical Journal, 214, 481-518. Bhaduri, B., Bright, E., Coleman, P., & Urban, M.L. (2007). LandScan USA: A High-resolution Geospatial and Temporal Modeling Approach for Population Distribution and Dynamics. Geo Journal, 69,103–117. Caceres, N., Benitez, F.G., & Wideberg, J. (2008). Review of Traffic Data Estimations Extracted from Cellular Networks. Intelligent Transport Systems journal, 2(3), 179-192. Ding, J. (2010), Advances in Network Management.Taylor and Francis Group. Dobson, J.E., Bright, E.A., Coleman, P.R., Durfee, R.C., & Worley, B.A. (2000). LandScan: A Global Population Database for Estimating Populations at Risk. Photogrammetric Engineering and Remote Sensing, 66(7), 849-857. Elias, D., Nadler, F., Stehno, J., Krösche, J., & Lindorfer, M. (2016). Improving Public Transport Planning through Mobile Phone Data Analysis.Transportation Research Procedia, 4478 – 4485. Gonzalez, M.C., Hidalgo, C.A., & Barabasi, A.L. (2008). Understanding Individual Human Mobility Patterns. Nature, 453, 779–782. Gundlegård, D.. & Karlsson, M.J. (2009). Road Traffic Estimation using Cellular Network Signaling in Intelligent Transportation Systems. Wireless technologies in Intelligent Transportation Systems. IEA. (2012). Energy Technology Perspectives. International Energy Agency. Janecek, A., Valerio, D., Hummel, K.A., Ricciato, F., & Hlavacs, H. (2012). Cellular Data Meet Vehicular Traffic Theory: Location Area Updates and Cell Transitions for Travel Time Estimation, Conference on Ubiquitous Computing, U.S.A, 361-370. Khan, J. (2003). Handover Management in GSM Cellular System. International Journal of Computer Applications, 8(12), 14-24. Kumar, S., & Prakash, A. (2016). Role of Big Data and Analytics in Smart Cities. International Journal of Science and Research, 5(2), 12-23. Lee, K., Hong, S., Joon Kim, S., Rhee, I., & Chong, S. (2009). SLAW: A Mobility Model for Human Walks. In Proceeding, INFOCOM, Rio de Janeiro, Brazil. Mitchell, W.J., & Casalegno, F. (2008). Connected Sustainable Cities. MIT Mobile Experience Lab Publishing. Permata, Z. (2014). Generic Packet Radio Service ppt. slideplayer.info, Accessed on 30nd December 2016. Portugali, J. (2000). Self-organization and the City, Springer. Portugali, J. (2009). Complexity Theories of Cities: Achievements, Criticism and Potentials. An International Conference on Complexity Theories of Cities. Portugali, J. (2011). Complexity, Cognition and the City, Springer. Pour Ahmad, A., Rahnamaee, M., & Kalantary, M. (2003). Examining the Geo-position of Crimes in Tehran City, Pajuheshhaie Goghrafiaee, 44, 81-98. Ratti, C., Pulselli, R.M., Williams, S., & Frenchman, D. (2007). Mobile Landscapes: Using Location Data from Cell-phones for Urban Analysis. Environment & Planning, 33(5), 727–748. Semanjski, I. (2016). Transport and Traffic Analytics in Smart Cities, Conference on Data Analytics, Vencie. Statistical Center of Iran (2006). Population and Housing Census. Tehran Municipality (2006). Tehran Master Plan. United Nations Global Pulse (2013). Mobile Phone Network Data for Development, 1-12. United Nations (2014). World Urbanization Prospects: 2014 Revision. Zhang, X., Yi, Z., Yan, Z., Min, G., Wang, W., Maharjan, S., & Zhang, Y. (2016). Social Computing for Mobile Big Data in Wireless Networks, Computer, 49(9), 86-90.